I’m excited to show you my personal project that I’ve been meaning to do for a long time. I’m a confesed fan for Berserk, the manga (not that much a fan for the animes, but this is a topic for other places) almost since it started being published in Spain. This manga has various story arcs following years on Guts’ life, the black swordsman, since his humble beginnings as a mercenary in the Band of the Hawk (Golden Age arc), the betrayal he suffered and his subsequent lust for revenge (Black Swordsman arc), his search for attonement and recover what was lost (Conviction arc), the strange troubled times that followed (Hawk of the Millenium Empire arc) and going on with its latest still going saga (Fantasia arc). This is a grim story, hard and without remorse of showing extremely violent and gory scenes, or with lots of sexual content, but caring enough to show the growth of their characters in a way that I have yet to see in another manga. One thing I realized being a wargamer is how many games there are which let you create a Band of the Hawk look alike, the mercenary band who fought alongside Guts during the Golden Age arc. Many games offer bands that, wheter for its aesthetics or the system itself, could easily be passed as being those warriors from Midland, but I never found miniatures for the right scale, and those who were usually portrayed their characters from diferent story arcs. So I told myself ‘Why not do them myself’ So I armed myself of courage (and also putty) and I got down to work. My own Band of the Hawk miniatures from Berserk! 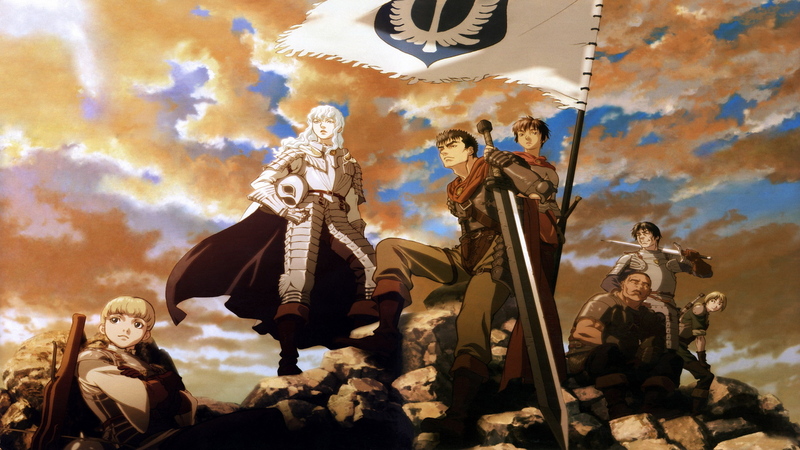 From left to right: Rickelt, Griffith, Guts, Casca, Pippin, Corkus and Judeau. I’ll be warning you that this modelling process I’ll be showing is a long one spanning weeks of work. I’ll be uploading lots of pictures of the miniature design and its progress, but for ease of reading I’ll cut the full process in smaller posts. Each character will have its own saga of posts. I had a struggle trying to decide which one to start with. Guts is the main character of the manga, but Griffith is the leader of the Band, and I finally decided for the albino swordsman. First I needed to build a skelleton where the whole miniature would be build uppon. Behold Mr. Hughs Stickman! Once I had the armature, I needed to decide which pose would it be. Griffith is usually portrayed as being calmed on the battlefield. He is a cold an cunning warrior, capable of taking advantage of the strenght of his rival to his own needs with only a flick of his writst or a bold move, so I decided to give him a relaxed guard stance, awating for its enemy to make the first move. Griffith and a Bagh Mari from Infinity. The Odd Couple. We’ll cut it here so the post is not heavy on words nor image size. By the way, thanks to this post we’re starting a new category on this blog: Original miniatures! No conversions in this category, just miniatures created entirely by me. I hope you like them and thank you to everyone who follows and supports me!